NGK has been developing spark plug technology since the 1930s and manufacture plugs for every type of automotive engine, as well as for motorcycles, marine, horticultural, plant and many other applications. In fact NGK produces and stocks over 1,000 different types of spark plug and every product matches even the most demanding manufacturers' specifications. 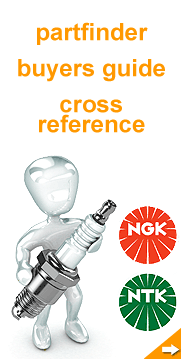 The vast experience and technology that NGK has ensures that there is no doubt that NGK are the world's No.1 spark plug. Prices shown in currencies other than UK£ are only indicative prices in your selected currency. You will be charged our UK£ product prices at your bank's current exchange rate. Vega Racing Components Ltd are an authorised UK NGK parts supplier for Spark plugs, Glow plugs, Lambda Sensors and SparkPlug Caps. Our products are suitable for the following uses: Horticultural, Marine, Commercial & Industrial, Snowmobile, Quad Bikes & ATV, Cars and Light Commercial, Motorcycles and Scooters.